The UCLA Neurotology Program provides comprehensive management of temporal bone disorders. Faculty in the UCLA Department of Head and Neck Surgery and the Department of Neurology and Neurosurgery comprise an interdisciplinary team for the evaluation and treatment of the gamut of neurotology disorders, including benign and malignant tumors, recurrent infections and disabling conditions resulting in loss of hearing and balance. The UCLA Neurotology Program has been recognized as an NIH "Center of Excellence" in neurotology in the United States. Over 30 years of experience in clinical care, research and education provides patients with the most advanced medical and surgical therapies available today. The UCLA Neurotology program is also recognized as one of the few centers of excellence designated by the State of California for cochlear implantation surgery. The program's Vestibular Function Testing Laboratory, established in 1961, developed computerized analysis and rotary testing that still serves as the gold standard for testing of vestibular function. 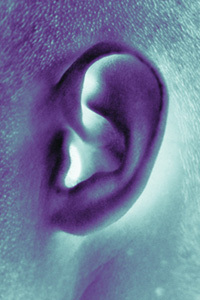 A modern audiometric testing facility tests the newest hearing aid devices, including cochlear implants, making them available to patients as emerging technologies. New patients receive an initial consultation by a neurotologist and, if appropriate, a neurologist or a neurosurgeon. Both medical and surgical therapies are available, depending on clinical findings. There is close coordination with other treatment specialists for trauma and cancer patients. Consultation reports on clinical findings and treatment recommendations are sent to referring physicians. Patients are returned to the care of their physicians upon conclusion of treatment. Inner ear vasculature: Surface preparation of the human stria vascularis. 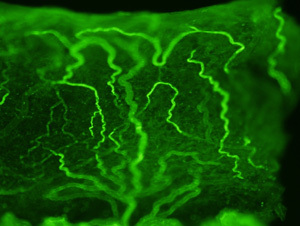 Blood vessels where stained with the issue of fluorescent isolectin. Referrals are made to the Vestibular Function Testing Laboratory for patients with dizziness and balance problems and to the Audiometric Testing Laboratory for patients with hearing deficiencies. For information, referral, and appointments, call: (310) 206-6688.